Shelby 6-pc. Dining Set w/Bench Dynamically different, the 6-piece Shelby dining room collection is sure to make a statement. Visibly contrasting black and white colors draw the eyes and cast a dramatic shadow. It still manages to keep a casual air though with its welcoming wood tones. Not only does Shelby look great, this collection also offers plenty of functionally. The dining table has four drawers while the server introduces three more drawers and two shelves behind glass doors. Speaking of storage, you'll also notice this server can hold up to 24 bottles of wine! Dynamically different, the 6-piece Shelby dining room collection is sure to make a statement. Visibly contrasting black and white colors draw the eyes and cast a dramatic shadow. It still manages to keep a casual air though with its welcoming wood tones. Not only does Shelby look great, this collection also offers plenty of functionally. The dining table has four drawers while the server introduces three more drawers and two shelves behind glass doors. Speaking of storage, you'll also notice this server can hold up to 24 bottles of wine! L: 24" x W: 20" x H: 42.5"
We absolutely love this table! It has so much character. The drawers also provide extra storage. It’s perfect in my black and white kitchen. I love how sturdy it is. I got 4 chairs and the bench to accommodate my 8 grandkids. Love how it looks in my dinning room. It goes wella with our walls and it is perfect for everyday eating. I ABSOLUTELY LOVE THIS DINING SET. 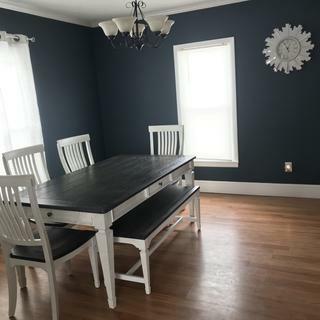 THE FINISH ON THE TABLE AND CHAIRS AND BENCH IS PERFECT. NOW I GET TO PAINT THE KITCHEN GREY AND WHITE TO MATCH THE SET. We had a lot of help at the store and ended up getting exactly what we needed! Very high quality dining set. Went with the 6pc set and couldn’t be happier. The gray tabletop and seats are very durable and look amazing. The table has good weight to it and the drawers on each side of the table are genius for keeping placesets, formal silverware, or really anything. Best purchase I have made! The reason for 4 stars is I only received the table with four chairs the bench nd the server are on back order. I went from a formal mahogany dining room set to this and we really like this one. It opens up the entire room. The table and chairs are very strong and that's a good thing. The drawers on the sides of the table are shallow but I put a table cloth and place mats in one a larger platter in another drawer and my husband likes to write at the table so instead of the pad and pens being on the table he puts them into drawer. I think this is going to work very well for us. I love this dining room set! It is very comfortable to sit at even though the seats are not cushioned. I really like the drawers on each side of the table. Quality seems good overall but honestly I already noticed a slight chip on the table top after a few days of having the table. We did get a five year warranty where they will come and fix any dings or dents that happen from usual wear so I'm happy to know we will get it fixed because I really like it. I love the white distressed legs and charcoal top to accent the table. My style is farmhouse and it goes perfect. 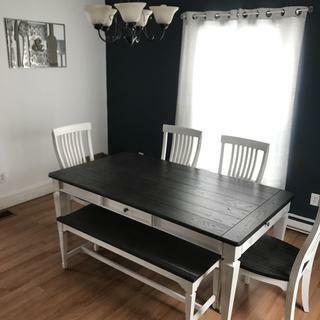 The chairs are really nice quality and sturdy as well as the table and I'm really happy with the table. Its beautiful! I recommend it with the 5 year warranty. I love it !! Just wish I received the entire set not just the tables and 4 chairs!! We love the furniture but be aware the coat of pain on top is very thin and you can easily scratch, removing the paint and exposing the wood. We love the table and bench. However the chairs are on back order and the manufacturer keeps pushing back the date. We’ve already waited a month and now they’re saying 2 more weeks.